Please leave your feedback on Map Blacklist for Public Test 1.5, and remember to remain on-topic and constructive. I want to ask a question then. If Ensk and Himmelsdorf banned by arty players, what will happen in open filed maps? Let me tell you something we will face with 3 arty on every open field maps. You should make this game with less arty. Max 2 arty players for each game. So are we going to end up with 10 HTs per side in Himmelsdorf or 7 LTs + 3 SPGs every battle in Prokhorovka? I would like to blacklist all maps that have removed cover, hills, ditches etc to make a balanced game instead off the open flat fields that only serve the wheeled vehicles...........damn, that is almost every map in the game. All maps that not have these "changes" have been removed in the past and the reworked ones are flat open field like ones now. If we can block maps can we also have old removed maps back then? Apparently WG want to give us options but it seems we are not allowed to choose maps where wheeled vehicles might get into trouble and such. When we are allowed to choose, ALL maps must be available to choose from and not just the few crap maps that are in the game now. Edited by _PanzerBitterbal_, 12 April 2019 - 11:03 AM. Blacklisted map should be removed from all modes, not just standard battle. How can I blacklist maps on CT 1.5? I need new glasses, I guess. Edited by Crusader2k13, 13 April 2019 - 08:57 AM. A feature that many players have requested for a very long time. 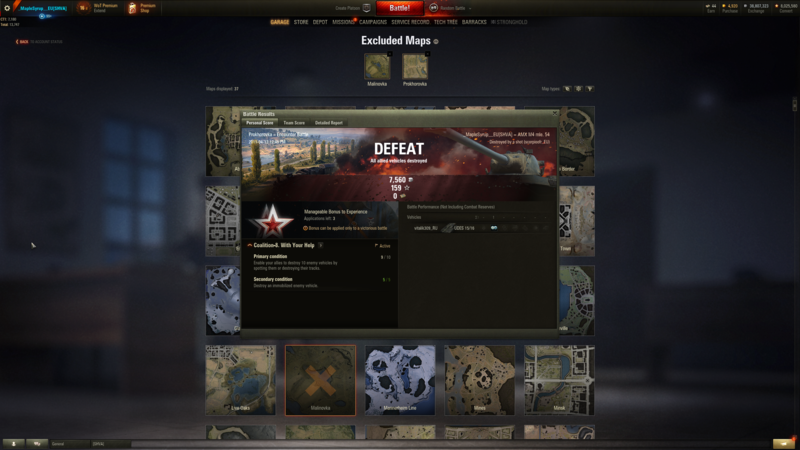 Of course, it would have been even better if all maps were designed good enough to not require a map blacklist, but since they're not, very good job WG of implementing it. Although, there's one thing that I really don't like, and that's that you allow premium accounts to blacklist 1 extra map. That can indirectly be considered P2W since blacklisting maps that you or your tank perform bad on can allow you to win more (since you get a higher frequency of maps that you perform good on). I know it's not a drastic difference, but the principle is still there and you should aim to eliminate P2W as far as possible. I would like to suggest that you give all players the same amount of blacklisted maps, and to be entirely honest, I don't know if 2 slots is enough. Maybe atleast 3-5? You played Ecounter mode. You cant exclude map from Ecounter. Read the news. I think being able to blacklist 2 maps with premium vs 1 with standard acc is bad for the game. All other added features of new premium acc are fine and welcome, but having standard acc players literally playing the worse version of the game from now on seems harsh. having standard acc players literally playing the worse version of the game from now on seems harsh. Life is harsh when you are a pauper. If you want to exclude encounter mode then exclude encounter mode.